Countless children around the world live in constant lack of basic necessities. Their parents or grandparents may do their best to provide, but without even basic education, their futures look dim. Manisha’s family lived in a dangerous place filled with gangs and drug lords, but it was home—until her father disappeared into custody under suspicions of gang involvement. Her mother frantically sought his release, but tragically, he was never seen again. She eventually suffered a mental breakdown in her grief and was sent to a rehab center. Home would never be the same. Manisha and her brother grew up with their grandparents instead of their mother and father. The elderly couple worked long days in tea-packaging factories to provide for the family. They did their best, but missing even one day of work jeopardized that day’s meal. Education came and went sporadically from Manisha’s life. Limited resources often hindered her and her brother from attending school, and they could never afford the tutoring they needed to truly succeed in their studies. It seemed they would spend their childhood—and possibly their adult life— hoping for food and financial breakthrough, unless some miracle occurred to give them a future beyond low education and daily labor jobs. One day, Manisha happened to meet a woman who taught at a nearby Bridge of Hope center—one supported by GFA friends like you. The little girl told the teacher, Shobi, how her grandparents began raising her and her brother and how difficult it was to get any education. Shobi grew sad as she listened to the girl’s story. Manisha’s childhood was not one anyone would wish upon a child. Many others around the world have felt Shobi’s same compassion for needy children and have donated toward GFA’s Bridge of Hope Program—which meant Shobi could invite Manisha to come to the Bridge of Hope center and receive free tutoring. Thrilled by this generous offer, Manisha went home and recounted everything to her hardworking grandparents. This turn of events was beyond their imagination! If Manisha could receive free tutoring, she would be equipped to thrive in school. And beyond that, Bridge of Hope would give her books, a bag, shoes, stationery, medical care and a daily nutritious meal. Each of those gifts would ease her grandparents’ financial burden and greatly impact the entire family. When Manisha started attending the Bridge of Hope center, she was woefully behind on her studies. She had missed so many school days in the past, and she found it difficult to adjust to consistent schooling. But her tutors at Bridge of Hope encouraged her, and with diligent study, she slowly caught up on all of her subjects. Children who attend Bridge of Hope centers across Asia receive the tools they need to excel in life. Their futures are bright! Through the holistic care she received at the center, Manisha’s confidence and character also improved. She began taking initiative at home, helping her grandparents with cooking and cleaning. She embraced character traits such as diligence and respect, and she tried to set a good example for her family. “I want my other friends also to experience the joy I have found,” Manisha said. Today, Manisha’s grandparents rejoice to see their 11-year-old girl blooming into a capable, kindhearted young lady. 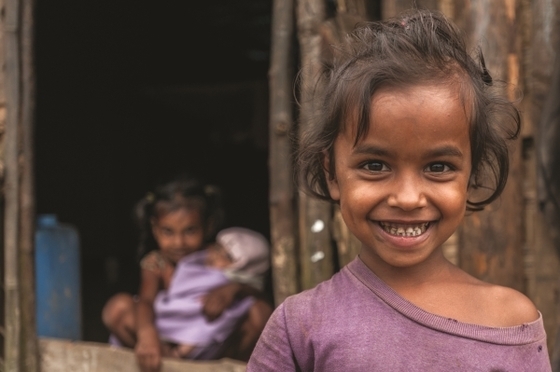 Although trials at home remain—Manisha’s mother is still gone and hard work is necessary to care for the family—there is a new presence of joy and hope in their home. Once again, home would never be the same.